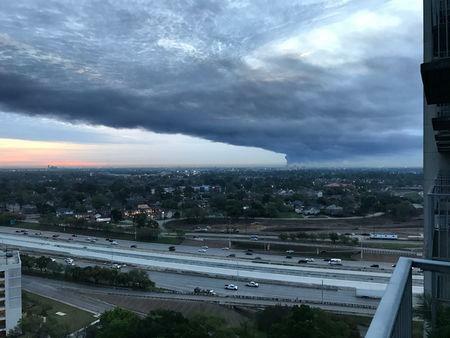 HOUSTON (Reuters) - Fallout from a petrochemical fire outside Houston continued for a sixth day on Saturday, with emergency workers struggling to remove volatile fuels from exposed tanks and ship traffic disrupted on the nation's busiest oil port. A fire that burned for three days broke out last Sunday at Mitsui & Co's Intercontinental Terminals Co site in Deer Park, Texas. It damaged or destroyed 11 giant tanks each holding up to 3 million gallons of fuels used to make gasoline and plastics. On Friday, flames again erupted for an hour and halted efforts to remove volatile fuels that leaked when a containment wall breached. There were no injuries reported on Friday. The leak and fire prompted the U.S. Coast Guard to close a portion of the waterway connecting Houston to the Gulf of Mexico. On Saturday, 23 ships were waiting to enter the ship channel and 20 ships were waiting to leave, according to Houston Pilots, whose members guide ships in and out of the port. The waterway remained closed between Tucker Bayou and beacon 116 on Saturday, said JJ Plunkett, port agent for Houston Pilots. ITC repaired early on Saturday a 10-foot wide breach in a containment wall that had allowed chemicals to escape the site and had spread fire outside the facility for a time on Friday, a spokesman said. ITC said on Saturday it hoped to restart efforts to remove the fuels but could not say when they could begin. The state on Friday filed suit against ITC alleging unauthorized air pollution and unauthorized outdoor burning, citing the three-day fire and releases of benzene and volatile organic compounds into the air. The suit seeks at least $100,000 in civil penalties and costs. It was unlikely the channel along the ITC site would reopen on Saturday because of efforts to halt the spread of chemicals into waterways and fumes from exposed fuel tanks, Plunkett said. Ships were able to reach Exxon Mobil's Baytown terminal, Kinder Morgan's Bostco terminal, the City of Houston's Bayport and Barbours Cut container terminals, an area covering about 10 percent of normal traffic, he said.